Make Two or More in An Afternoon! 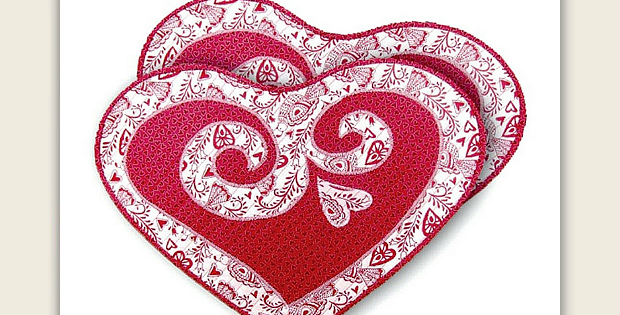 All the exuberance of heartfelt love is captured in these lovely quilted placemats. Make one for a table centerpiece or two for celebrating with that special someone. Four will be lovely arranged points together in the center of the table while waiting for place mat duty. However many you make, they go together easily, even for beginners. Fusible applique makes them a quick project. You can have a couple finished up in an afternoon. Five fat quarters will make two place mats. Select pretty fabrics in colors to fit the mood. We can easily imagine them in something other than red, if that strikes your fancy. The finished place mats, from Monica Curry Quilt Patterns, are 20″ x 14″. 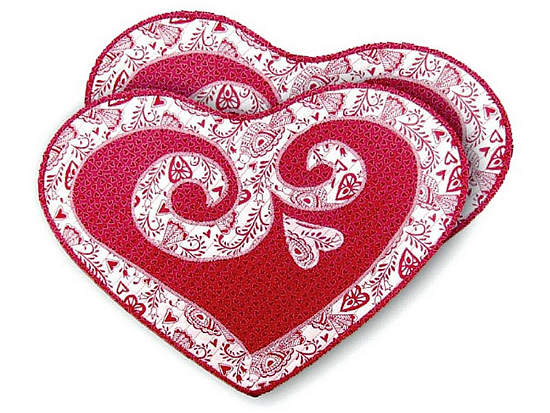 Click here to purchase the “Sweethearts Valentine Placemats” pattern.